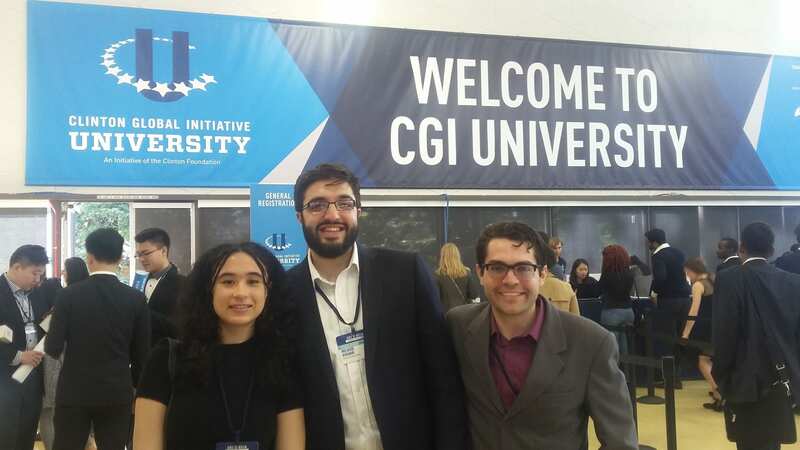 Three UCL students were selected from amongst hundreds of applicants to travel to San Francisco and attend the ninth Clinton Global Initiative University (CGI-U) conference at the University of California, Berkeley. 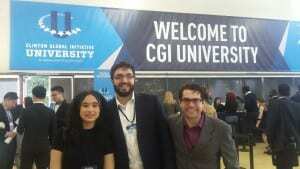 UCL is one of just two UK university members of CGI-U and students representing the faculties of Arts & Humanities, Engineering and the Institute of Education joined more than 1,200 others from over 70 universities and 45 countries to take part. All had made a ‘commitment to action’ – a project to improve an aspect of a community based locally or overseas, in the fields of education, environment, poverty, peace, human rights or health. Founded by former US President Bill Clinton – pictured below with the Global Engagement Office’s Programme Manager Rachel Corcoran – CGI-U builds on the successful model of the Clinton Global Initiative, which brings together world leaders to take action on global challenges. UCL students can apply for funding to develop their projects via CGI-U’s Innovation Fund, even if they did not attend the conference. Naomi Poyser, final year undergraduate in Greek & Latin and Student Enterprise Ambassador at UCL Advances, built Greenseed, an app to encourage users to share tips and advice on growing their own food. Her favourite part of the conference was a panel discussion chaired by Clinton, with the founders of Pinterest, Khan Academy, MuslimGirl.net and Cady Coleman, a NASA astronaut. “This discussion blew me away; the panel members were all so charismatic and had great insight to share from their amazing and varied experiences, and Bill Clinton kept the discussion exciting and impactful,” she said. Francisco Cordoba Ortalora, studying an MA in Lifelong Learning Policy & Management, created Diaspora Colombia, a mentoring programme and e-learning platform that empowers young Colombian leaders from disadvantaged backgrounds to engage in world-class education. The delegates also picked up practical advice. After developing Scoodle, a system enabling students to search and instantly book lessons with tutors in any subject, first-year Computer Science student Mujavid Bukhari said attending CGI-U helped him learn about increasing organisational capacity and fundraising from leaders in the field. The students spoke of the value in networking with like-minded peers. 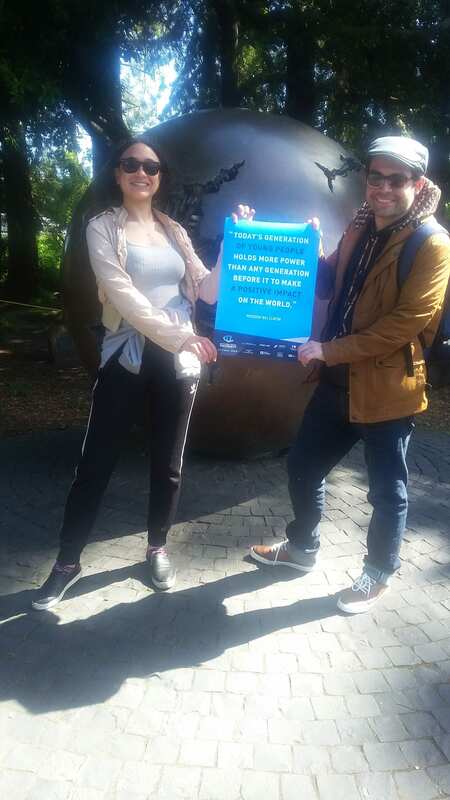 Naomi added: “Meeting students from all around the world who are all working towards addressing world problems was incredible and gave me so much hope and motivation. I met people who I will definitely be staying in touch with, and who I could potentially collaborate with in the future.